Let FIREHOUSE Software take your database management headaches away. FH Cloud is the FIREHOUSE Software application you’re accustomed to with all of the module features you rely on day to day. Our skilled FH technicians can upload your FH database to our FH data center (the FH Cloud), and you (or your IT Staff) never have to worry about performing database maintenance, creating backups, or purchasing and maintaining expensive hardware again. Our IT team takes care of it all. Once loaded, internet access from anywhere, public or private, lets you access your FH system and data LIVE. You can even have full access through an iPad or Android tablet. Data entry made simple! 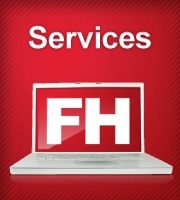 FH Cloud is compatible with Internet Explorer, Safari, and Mozilla Firefox (prior to Firefox 52). 64-bit browsers are not supported.